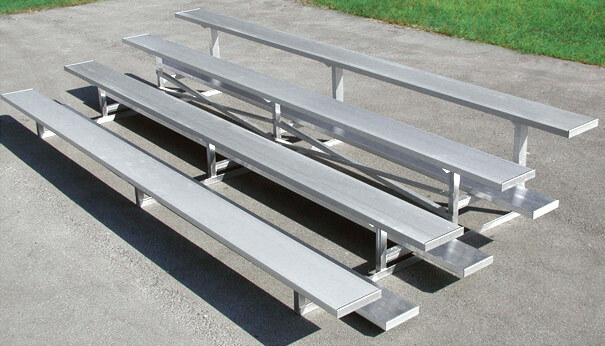 These premium quality bleachers feature aluminum angle frame understructure making them ideal for level sites. For outdoor use, install with in-ground, earth anchors or tie-in to a concrete foundation. Perfect for indoor use too! High strength to weight ratio 6061-T6 aluminum alloy extrusion footboards naturally protect from corrosion. Standard mill finish walking surface. Chemically cleaned aluminum welds. Galvanized hardware will not rust like zinc-plated hardware. Tip and Roll kit, available on 3 and 4 row units, allows to easily tip the bleachers into the upright position, and using the 5" non-marring swivel casters, simply roll the unit to its storage spot. 3, 4, and 5 Row Units. Slim Profile for Efficient Storage. Chain Link Guardrail on 5 Row Bleachers. 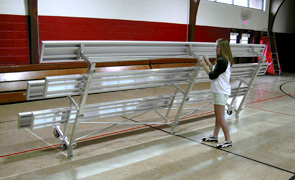 All seat and foot planks accommodate 120 plf across a 6' span with a maximum deflection of 9/16".